Evo 2017 gaming competition expects to draw 20,000 to the Mandalay Bay Events Center. The big names are there. Marvel, Tekken, Street Fighter V, and Injustice will all have their spotlight as professional gamers compete for the grand prize and internet bragging rights. 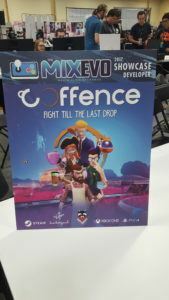 Coffence is a game combining coffee and fencing from Sweet Bandits Studios. Players fight with coffee cups in an attempt to defeat opponents by stealing their coffee. 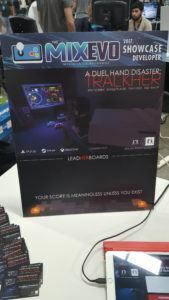 I predict the Seattle and Portland markets will quickly adopt this game unless their consoles short out from throwing real life cups of coffee at each other. The game developers left Activision to follow their own path. Leaving the safety of a steady paycheck from the Call Of Duty franchise wasn’t an easy thing. Coffence was originally intended as a test for the Lumberjack game engine. The response was so good the team decided to push back the planned project and move forward on Coffence with expanded characters and mechanics. GUTS is a dismemberment game from Flux Game Studio based in Sao Paulo, Brasil. This game is different than most 2D fighters. There is no health bar, no game timer, and the available player move set are dependent upon which limbs they still have. The round ends when a fighter loses all limbs and is quartered. There is a gore element to the game play that comes off as more funny than gross and some environment attacks that add to the overall experience. Studio founder Paulo Santos started his career making proprietary games for other companies. This experience refined the team’s skill to the point they felt comfortable doing their own project. With the strong combat sport tradition found in Brasil, this game has some legs already and is looking to expand globally. 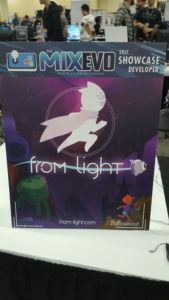 From Light is a 2D puzzle platformer similar to the popular Steam game Limbo. It has photographic tools allowing the player to freeze frames and performs tasks to finish the game. It was originally at student project for Sherveen Uduwana and team at USC. This is a skills-based game with some darker elements and much calmer than adrenaline-fueled fighters. A PC only demo is available for download from the site. Omen of Sorrow utilizes major characters from the horror genre, gives them fighting move sets, and pits them against each other. 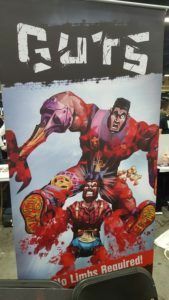 AOne Games is from Santiago Chile and plays to release this 2D fighter March 2018. The graphics in this one are slick and smooth, which is pretty cool. Four characters were available for play at EVO2017. There are 12 total in the game, and all 12 avatars will be included in the full roll out. My favorite indie game so far is by Ask An Enemy Studios. It’s A Dual Handed Disaster or ADHD for short. The name is an accurate description of the game. Players play a split screen simultaneously drawing from the right to the left screen to stay alive. On the right screen, player move around the screen gathering resources similar to Pac Man so the Galaga-like shooter on the left can stay alive. If it sounds busy and confusing, it is, but captivates the attention and multi-tasking skills of everyone. He’s in the final phase and is offering the last 10% of equity in the launch as part of a Kickstarter campaign to fund the process. Support his path by checking out his story.